Q: How do you know when there’s a harmonica player at the door? A: He doesn’t have the key, he just comes in whenever he feels like it. Q: Why are conductors’ hearts so coveted for transplants? A: They’ve had so little use. 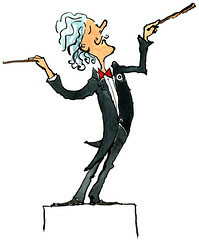 Q: What’s black and brown and looks good on a conductor? These guys are really good; check them out. The singers are Linda Davis, Miky Tayoba, and Rhett. Thomas Mcarthy on Cajon, Trevor Fields on electric guitar and Produced by Sam Bashor. They started as friends and decided to form a band late 2011 in Santa Clarita, California. Tory Boy phoned last night. Not to chat to his mother or tell her how much he loves and misses her and he should never have left home to go to university, leaving her bereft and jobless. No, he called because he wants me to promote a music festival he’s helped organise. Fair enough: I’m a mother; doing as I’m told by my adult children is part of the job description. 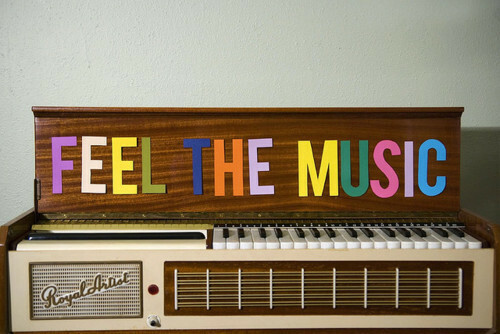 What: MUSIC! LIVE BANDS! DJs! The festival has been organised by Bailrigg fm, the student radio station at Lancaster University. It is the first time they have tried something like this and they are hoping to make it an annual event. The students have organised everything, including the food (done at the last minute by Tory Boy himself, so you know who to sue). TB will be doing his DJ sets at 12 – 12.15 and 12.45 – 1, UK time, so please check him out if you happen to be online. Click here for an international clock. Then report back to me: I can’t be doing with all that nasty, modern music. I’ve recently come across this Irish singer; she’s brilliant. Her album could be described as neo-rockabilly. She made painting the ceiling fun. I meant to post it days ago but I forgot. As I have lifted one item from another blog, I might as well compound my crime by sharing this, which had me laughing out loud, and not just in a polite lol way. It’s too good a story not to share. Vivinfrance wrote an interesting piece about haggis; this was one of the comments, from The Poet’s Quill. I’ve never been anywhere where haggis was served. I would love to try it. I’ve had both fried rattlesnake and alligator, of course they are cold-blooded critters, but they were good. We had a difficult time getting a recipe for rattlesnake, but I’ll never forget the recipe we got from a friend’s mother. She was born and raised in San Antonio, Texas. My friend said that she would have a recipe if anyone would. This is how she thought they should be prepared. Cut off the head and discard, the thing still can bite even if it appears dead. Cut it into three-inch lengths. Take the three-inch pieces and flush them down the toilet.